your private jet gateway to London's financial district. 2016 is an important year for London City Airport (LCY). Having celebrated a record year in 2015, welcoming more passengers than ever before in its 28 year history, growth is set to continue apace. This year the closest airport to central London will open a new £16m Western Lounge, which will be 84% larger and create a modern open-plan space with 600 additional seats, as well as new food and drink and retail outlets. Further expansion is planned at LCY, through the City Airport Development Programme. The plans include an extension to the existing terminal, a new arrivals terminal, seven new stands and a parallel taxilane, to enable the airport to reach its permitted number of annual flight movements. Expansion will add some 30,000 slots to the constrained London market, create 2,000 new jobs and accommodate next generation aircraft that can serve new destinations from LCY including the Middle East and USA east coast. LCY is a first choice for business travellers to and from the UK, and is loved for its location just minutes from Canary Wharf and the City of London, the speed it offers to passengers with a quick check-in (20 minutes door to lounge) and quick arrival (15 minutes tarmac to train), and excellent customer experience, with unlimited free wifi for all passengers, free drop-off, shoe shine and a business-class feel throughout. Expansion will enable the airport to continue offer these services, connecting business in London to Europe’s commercial centres and beyond. The development programme will be the subject of a public inquiry in the spring and the airport is confident of a positive outcome. London needs additional aviation capacity in the short term and London City Airport can provide that within two to three years. 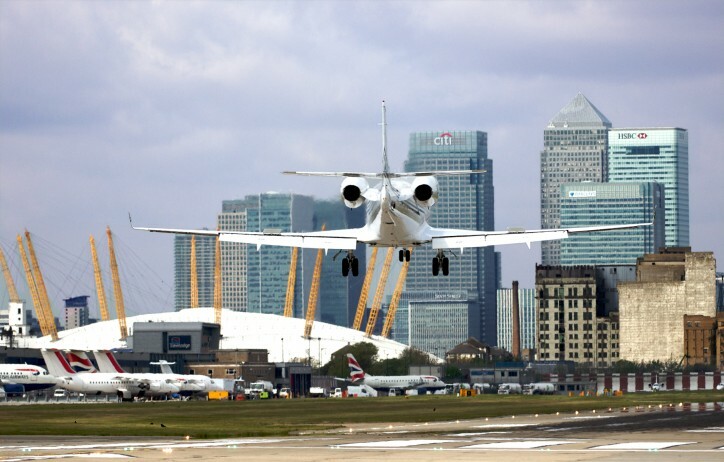 Private jet charter utilsing London city airport continues to increase due to the proximity of the airport to the financial district. The Jet Centre allows for speedy transitions to and from your private jet charter to transfer you into the heart of the City.